In a large skillet fry the bacon. Remove the bacon from the skillet and drain on paper towels. Chop or break the cooled bacon into small pieces. In a medium-size mixing bowl, combine cream cheese, bacon, mayonnaise, and green onions. When mixed well, form 2 balls out of the mixture. Cover and refrigerate 3 to 4 hours, or overnight. 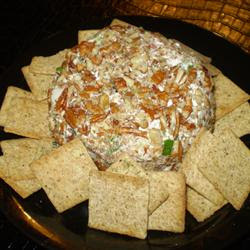 Before serving, roll the cheese balls in the chopped pecans.